You will be surprised how more smoothly business goes with our courier services. need to about the courier service. Ess-Express can make your courier service problems disappear by phoning 01983 527581. Having trouble with getting your items delivered to the Island ? 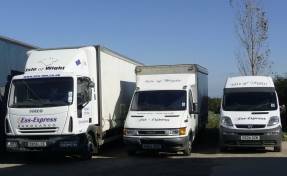 Most companies will offer free mainland delivery but will not deliver to the Isle of Wight, we have a receiving depot in Southampton where your items can be dropped off for us to collect and deliver to the Island next day or we can hold in our warehouse in Newport untll you need it.